Released near the end of Clara Bow's massive career in silent film, Frank Lloyd's Children of Divorce (1927) doubles as an early launch pad for future Western icon Gary Cooper. This brisk, 70-minute production was one of six films Bow starred in that year; it's often overshadowed by the career-cementing It and WWI drama Wings, the first recipient of a Best Picture Oscar just over two years later, but remains an essential slice of the once-dominant genre. As for the story itself? Couldn't be simpler, as Children of Divorce barely features more than a half-dozen "speaking" parts and only a handful of locations. Three characters form the bulk of the drama: first introduced as children living in a Parisian divorce colony---essentially, a residence for the abandoned kids of rich, divorced parents---young Kitty Sanders and Jean Waddington become fast friends, with both girls eventually vying for the attention of slightly older Ted Larrabee. Ted agrees to marry Jean if they're still single as adults...and some years later in America, Ted (Cooper) seems like he'll make good on his word after Jean (Esther Ralston) expresses her desire for a loving marriage not based on money. Unfortunately, Kitty (Bow) still has her eyes on Ted and marries the unwitting groom after a drunken night out, yet still seems attracted to the affluent Prince Vico de Saxe (Einar Hanson). OK, so maybe the story could be simpler...but to its credit, Children of Divorce does an admirable job of juggling the ever-shifting love triangle (quadrilateral?) as Ted, Kitty, Jean, and Vico's lives progress during the next several years, which includes at least one child and a suicide attempt. The mixture of idealistic drama and ultimate tragedy would probably fall apart in the wrong hands, yet Lloyd's film never feels overbearing just as the emotion never feels unearned. These are broken people leading broken lives, and Children of Divorce's frank examination of "sifting through the rubble" remains accessible and almost cathartic almost a full century later. So much has changed in the world of film---and not of film---since 1927, yet the unpredictable complications of life, family, friendship, and personal relationships remain a magnet for curiosity. Though many silent films from this era (not to mention "talkies", which began with Alan Crosland's The Jazz Singer less than six months later) explored such themes in a more nuanced manner, this interesting piece of silent film history is well worth seeking out. It's hard to believe that Children of Divorce never got an official home video release until recently; now approaching its 90th birthday, Frank Lloyd's film has been newly restored on Blu-ray courtesy of Flicker Alley (their 50th release!) and looks a bit younger than expected. Featuring a brand new orchestral score and a bonus Clara Bow documentary from 1999, it's a pricey but essential package for silent film buffs and curious newcomers alike. 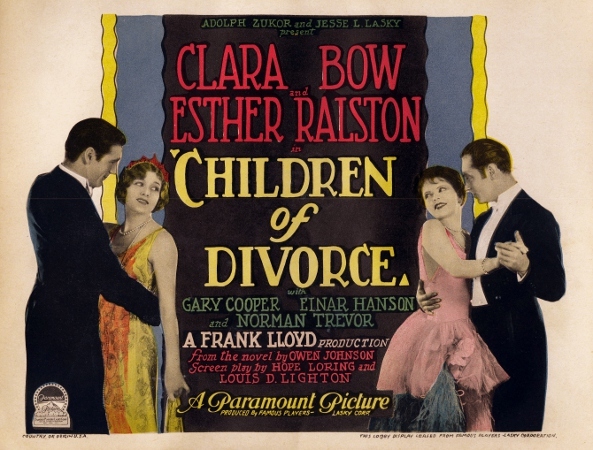 Flicker Alley's statement about Children of Divorce on Blu-ray: "Sourced from the original nitrate negative held by the Library of Congress, as well as their 1969 fine grain master, this new restoration of Children of Divorce was scanned in 4K resolution, and represents over 200 hours of laboratory work by the Library of Congress in order to create the best version possible." The result is unquestionably a great-looking 1080p transfer, extremely stable and boasting a fine level of natural film grain, terrific detail, and plenty of texture. Black levels and contrast are also strong without feeling artificially boosted, and the absence of common digital imperfections (excessive noise reduction, compression artifacts, and edge enhancement) is great news as well. It's obvious that plenty of care went into this release...and though a fair amount of dirt, debris, flickering, and other imperfections could be spotted along the way (especially in two similar "letter writing" scenes just after the 60 minute mark, which almost come apart at the scenes), this is undoubtedly the best that Children of Divorce has looked in decades, if not ever. Featuring a new score performed by the Mont Alto Motion Picture Orchestra, the lone PCM 2.0 Stereo track sounds exceptionally crisp and really enhances the atmosphere of Children of Divorce from start to finish. Dynamic levels and separation are strong, with no obvious hiss, dropouts, or other imperfections---and while a full 5.1 mix would've been great to hear, this two-channel track gets the job done. No subtitles are included, obviously. Treated with a simple, classy interface, Children of Divorce features smooth navigation and music from the film. This two-disc release (one Blu-ray, one DVD that should've been a copy of the soundtrack) arrives in an overlapping keepcase with attractive artwork and a Booklet featuring rare photographs, an essay by film preservationist and Clara Bow biographer David Stenn, notes on the bonus documentary by producer-director Hugh Munro Neely, plus a short write-up about the new score by Mont Alto Motion Picture Orchestra director Rodney Sauer. Just one, but it's worth watching: Hugh Neely's 1999 TV documentary Clara Bow: Discovering the "It" Girl (52 minutes) narrated by Courtney Love. 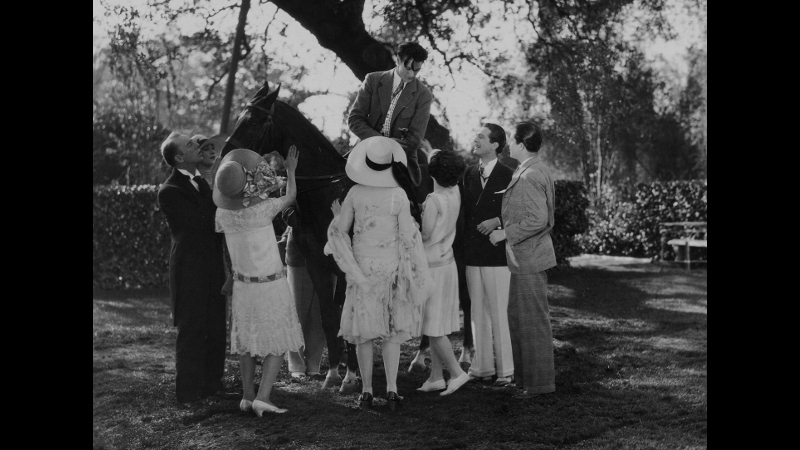 Featuring friends, family, and other parties including biographer David Stenn, son Rex Bell Jr., film critic Leonard Maltin, Paramount producer A.C. Lyles, actress Marion Shilling and more, it also features clips from several of Bow's most famous films. It's a great little documentary but this version is a bit rough in quality---I've never seen it other than broadcast, but what's here appears to be taken from a VHS source as evidenced by the limited resolution, compression artifacts, and occasional tracking lines. Still a thoughtful inclusion that die-hard fans will enjoy...unless they already own Kino's 2001 DVD of It, where it also appears as an extra. Featuring two of the decade's most recognizable ladies and a very early leading role for the up-and-coming Gary Cooper, Frank Lloyd's Children of Divorce---now 90 years old---is a standout production with plenty of heart, great visuals, and an accessible story that makes it a solid entry point for silent film beginners and a hidden gem for more seasoned buffs. Absent from home video and thus largely forgotten during the last 50+ years, Children of Divorce gets a sterling second life on Blu-ray courtesy of Flicker Alley (their 50th release! ), featuring a terrific A/V presentation and a bonus Clara Bow documentary from 1999. An audio commentary or other new supplements would've helped soften the sticker price, but this combo pack is still firmly Recommended to all interested parties.